The CyberHeart virtual digital platform currently in development. Professor Rance Cleaveland (CS/ISR) is part of a multi-institutional team developing a “CyberHeart”—a sophisticated digital platform used for patient-specific testing of current devices like pacemakers, as well as prototyping the next generation of implantable cardiac devices now under development. 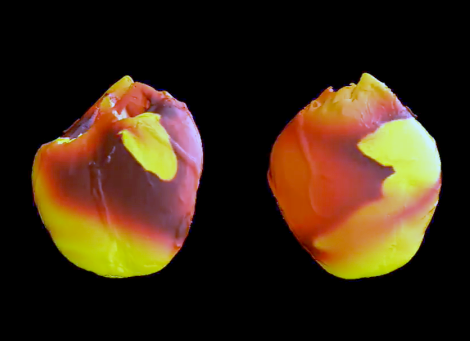 Cleaveland, an expert in the model-based testing of embedded software, is working to accelerate the development of improved implantable medical devices used in the treatment of heart disease. “We believe these virtual platforms can be used to design, test and validate implantable medical devices faster and at a far lower cost than existing methods,” Cleaveland says. Compositional, Approximate, and Quantitative Reasoning for Medical Cyber-Physical Systems is a five-year, $4.2 million National Science Foundation grant involving researchers from seven U.S. universities and centers. The research group’s approach combines patient-specific computational models of heart dynamics with advanced mathematical techniques for analyzing how these models will interact with cardiac medical devices. The results can be used in a clinical setting to optimize device settings on a patient-by-patient basis. “We’re able to take a specific patient’s history and then run a detailed analysis of how a device might work, interchanging different settings on the device and seeing the reactions, before the device is implanted in the patient,” Cleaveland says. For new devices under development, these same CyberHeart analytics can be used to detect potential flaws early on during the device’s design phase, before animal and human trials begin. “We believe that our coordinated, multidisciplinary approach—which balances theoretical, experimental and practical concerns—will yield transformational results in medical-device design and foundations of cyber-physical system verification,” says Scott Smolka, a professor of computer science at Stony Brook University who is the principal investigator of the project. In addition to Smolka and Cleaveland—who co-directs the project—other researchers include Edmund Clarke, Carnegie Mellon University; Elizabeth Cherry, Rochester Institute of Technology; Flavio Fenton, Georgia Tech; Rahul Mangharam, University of Pennsylvania; Arnab Ray, Fraunhofer Center for Experimental Software Engineering; and James Glimm and Radu Grosu, Stony Brook University. Richard A. Gray of the U.S. Food and Drug Administration also is a key contributor. NSF’s “cyber-physical systems” efforts seek to develop state-of-the-art engineered systems that are built from and depend on the seamless integration of computational and physical components. A video of some of the early testing is available here. ---Thank you to Tom Ventsias of UMIACS for this story.